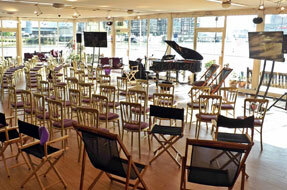 The Thames riverside venue. 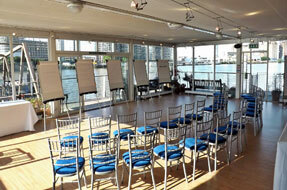 Function and meeting rooms for parties, wedding receptions, conferences and other events in central London. Westminster Boating Base is a unique venue, set in the attractive Pimlico Gardens. The spacious open-plan building lends itself to a wide variety of theming, with floor to ceiling windows all around to provide amazing views up and down the Thames. The venue has even been used as the setting for a number of blockbuster movies including ‘Love Actually’, starring Hugh Grant and Keira Knightley. 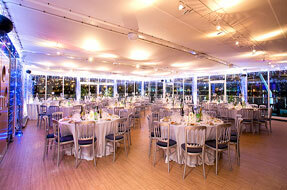 The principal function rooms are linked via the atrium, and the Pavilion extends over the river, with floor to ceiling windows all round to provide dazzling views up and down the River Thames, with its balconies as the designated smoking areas. 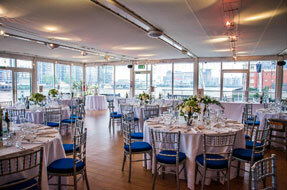 The Edgson Room also has a full length covered balcony to the river, and is equipped with special effects lighting and speakers for music and dancing. This arrangement is such that the sounds of a disco in the Edgson Room need not interfere with other guests in the Pavilion enjoying a quiet drink and conversation whilst admiring the views. As the Boating Base is a charity, the venue hire fee for the rental of the building goes directly to support the Trust’s charitable activities for young people. Many customers have expressed satisfaction in knowing that part of the cost of their event is going to a worthwhile cause. 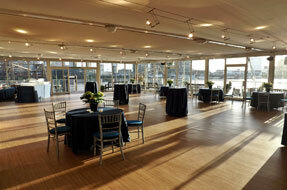 The Westminster Boating Base venue space is managed by resident company, Retro Catering Ltd., which is run by Mervyn Wycherley RVM, royal chef to Prince Charles and Princess Diana. 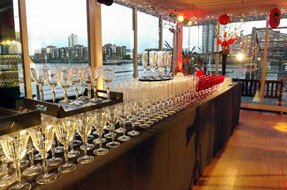 Established in 1985, our company has been catering and managing events at the Boating Base for over 30 years. Retro’s ethos is to provide good quality, delicious food. 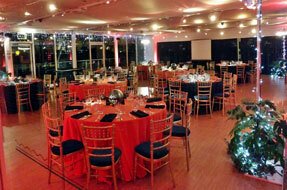 Our talented and enthusiastic team work to bring all the elements of an event together. We know how important our team are to an event; they are the face of our company and carry our reputation with them. As a company with over 30 years’ experience organising events of various sizes, styles and formats, we can offer you our expertise ensuring your event will run as smoothly as possible. Whether you choose to take your guests for a cruise down the Thames, enjoy drinks and pictures on the lawn, stream live congratulations from relatives in faraway countries, or have your best friend surprise everyone with a song, one of our dedicated event managers will work closely with you to tailor your event to your specific requirements and budget. Our packages are designed to include all essential items one would require for a typical event, including flexibility with timings and planning. All costs are known upfront so you do not have to worry about mounting bills after your event has finished. Every event we run is overseen by a dedicated event manager and their team, to run a smooth service with our trained and attentive waiting staff. Why choose Westminster Boating Base? 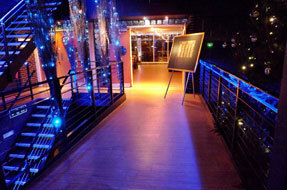 Looking for a stunning venue at a good price for a corporate or private Christmas party? 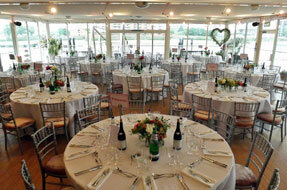 Our riverside venue could be right for you. 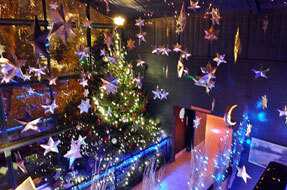 Our venue is themed for Christmas with a festive array of silver birches and fairy lights. The 30ft Christmas tree in our lobby provides a dramatic entrance. 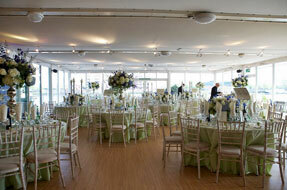 Flexibility is key to a successful event as far as we are concerned. 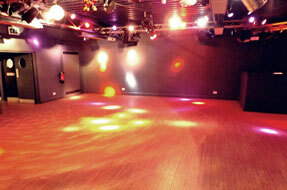 Venue is also available for hire as a blank canvas. The Boating Base is a stunning and unique venue for any type of event - whether it be a private party such as a family member's birthday - or a corporate affair such as your company's end-of-project celebration. Set back from the road, in an attractive park setting, our entrance provides an air of exclusivity and once inside, the panorama of the river and Battersea power station is a striking view from our riverfront balconies. The building lends itself to a variety of theming options and the gardens can be hired if you have an outdoor event in mind. Of course, the venue is just the back-drop to your party and our highly experienced events team will be able to help you plan your day and ensure that your guests feel at home from the moment they arrive. Many of our clients - both corporate and private - return year after year. 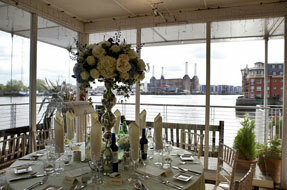 Westminster Boating Base is an idyllic setting for your wedding reception. 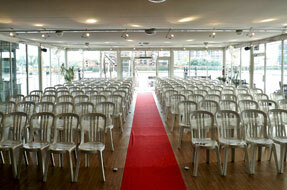 The main room is large and airy with floor to ceiling windows and a full length balcony extending over the river. 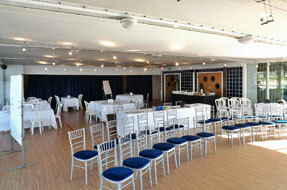 This room has the capacity to seat up to 150 people for a silver service dinner. The Edgson room has a full length covered balcony to the river and is equipped with effects lights and speakers for music and dancing. The configuration of the function rooms is such that the sounds of a disco need not interfere with your other guests enjoying a quiet drink and conversation whilst admiring the views. Our riverside location includes pier and pontoon access making us ideally suited to parties of guests leaving or arriving by riverboat, or the bride and groom romantically cruising off into the night amid cheers from their guests. Our main function room has floor to ceiling glass allowing for plenty of natural light and a fantastic view of the Thames. Our second room can be used as a break-out area or for serving food. Both main rooms have riverfront balconies for those essential leg-stretching and fresh air breaks. 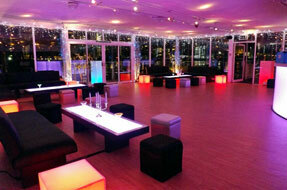 Audio-visual requirements are different for each event and we can source this for you. We are able to accommodate up to 130 theatre or cabaret style whether it's a meeting, exhibition, workshop, conference or an away day. With access to both of the rooms your event can include areas for team building exercises, chill out areas for group activities and so on. Nearest bus: 24, 360 & C10 at Pimlico tube station and Lupus Street. Grosvenor Road is a red route between 8am and 7pm during on weekdays. Outside of these hours and at weekends, you are able to park on the single red lines (southern side of the road between St. George's Square and Claverton Street). See the sights of London from the river Thames aboard a high-speed vessel. This could be a break-out activity as part of your conference, a thrillseekers activity for your party or a moonlit trip for the bride and groom.